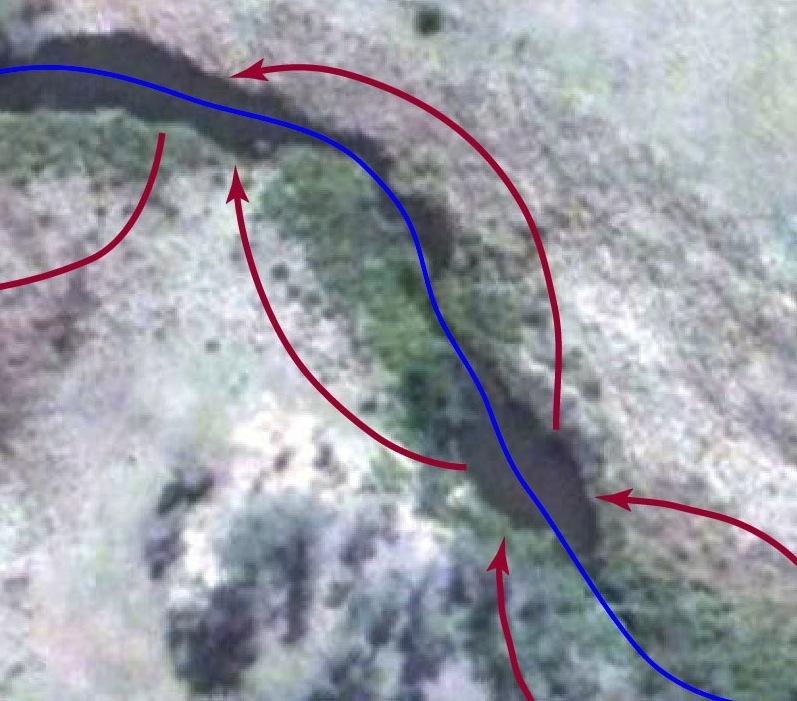 In some locations with deeply incised gullies, both the goal of channel-floodplain reconnection and the goal of lateral floodplain rehydration are pretty much out of the question, at least in any way that will benefit most species on the floodplain (other than deep rooted trees). One such example is the Natural Sequence Farming demonstration on the home farm at Mulloon Creek Natural Farms. To achieve either of the above goals would require a large engineered structure, which in a named perennial stream doesn’t sit too well with the existing regulations (extraction is achievable but would require a costly irrigation licence). 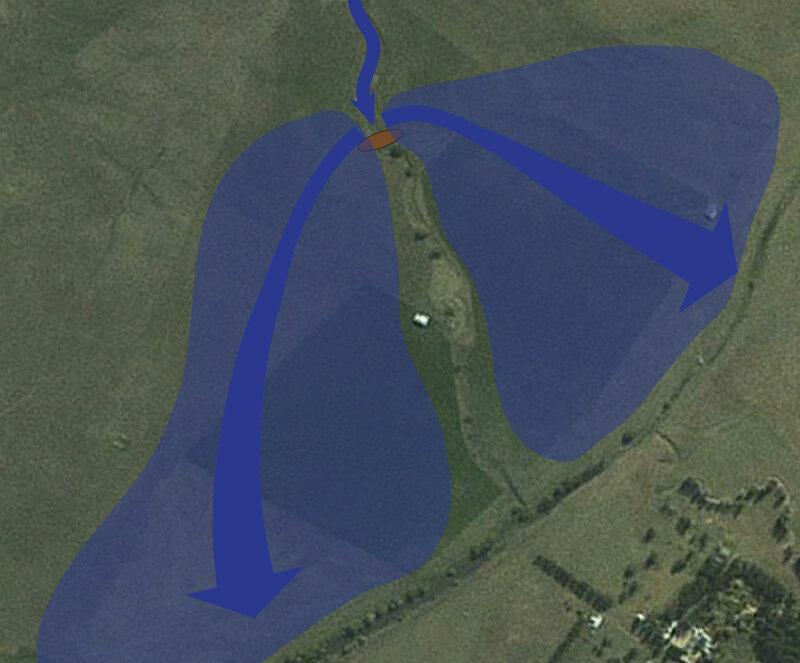 The locations where chains of ponds and swampy meadows existed in abundance at the time of Euro settlement, such as Mulloon Creek, are known as ‘cut and fill landscapes’. The ‘fill’ phase referred to in ‘cut and fill’ is relatively well understood. 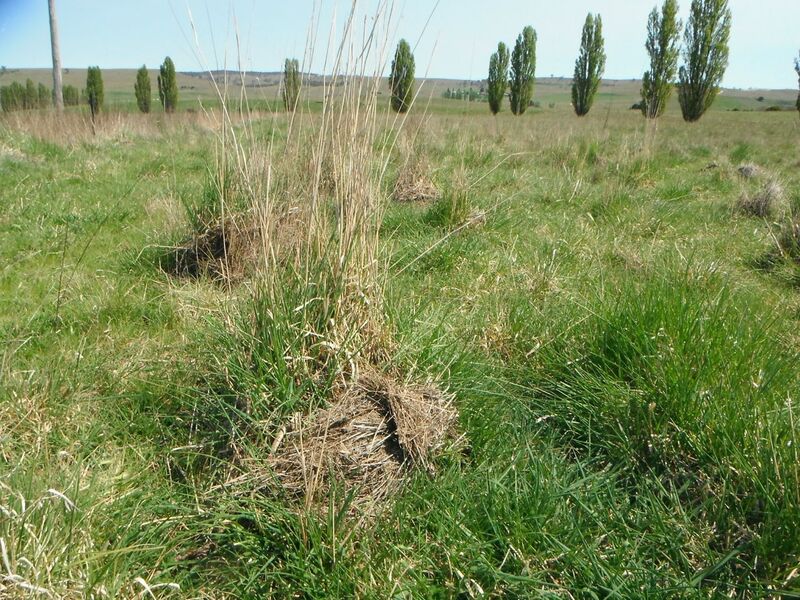 As Peter Andrews has popularised, dense wetland vegetation choked the discontinuous channels, slowing the water flow, trapping sediment and then binding it within vertically growing root mats. The ‘cut’ phase isn’t quite so well known. Although these systems could remain stable for thousands of years, they weren’t permanent. A natural disturbance could set a period of degradation into action, with erosion gullies cutting through the floodplain sediments. Eventually, the ‘cut’ phase stabilised and the ‘fill’ process would begin again (Johnston and Brierley, 2006). This rebuilding phase has in fact begun in some places. Zierholz et al (2001) wrote a great paper on the process, outlining the natural establishment of instream wetlands. In some places, their study found that dense reedbeds had accumulated up to 20 years worth of sediment from the associated catchment. 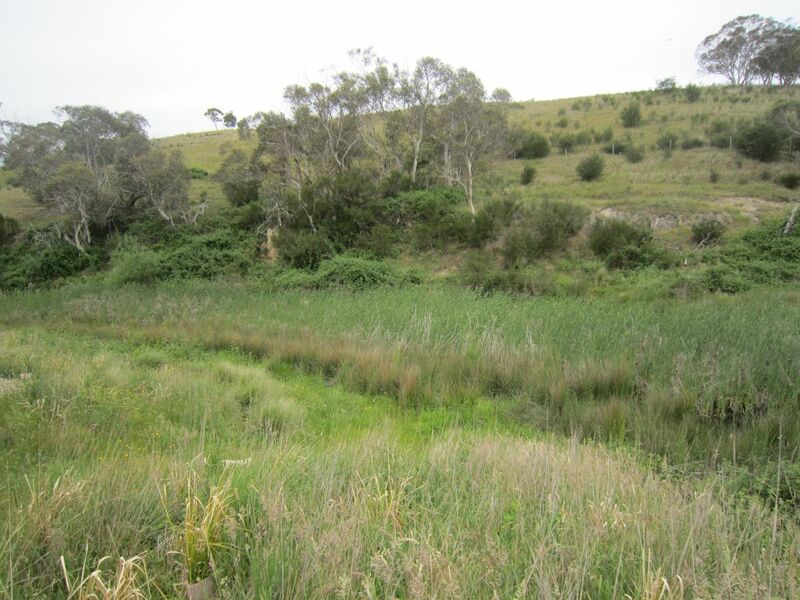 That is, the floor of the gully is aggrading, nutrients and sediment are being held, valuable wetland is being created, erosion is being prevented, and the main reason: lots of reeds have established. 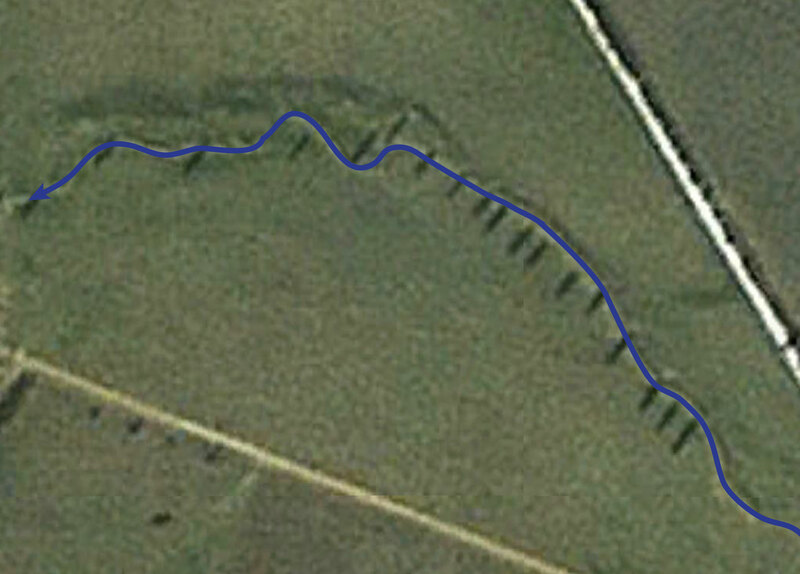 On Mulloon Creek, there are sections which before the NSF works were completed were either cut down to bedrock or basically gravel deserts, and had been that way since the degradation began, which likely occured in the early to mid 19th Century (Hazel et al. 2003). Those same sections now look very similar to the photo from the paper above. 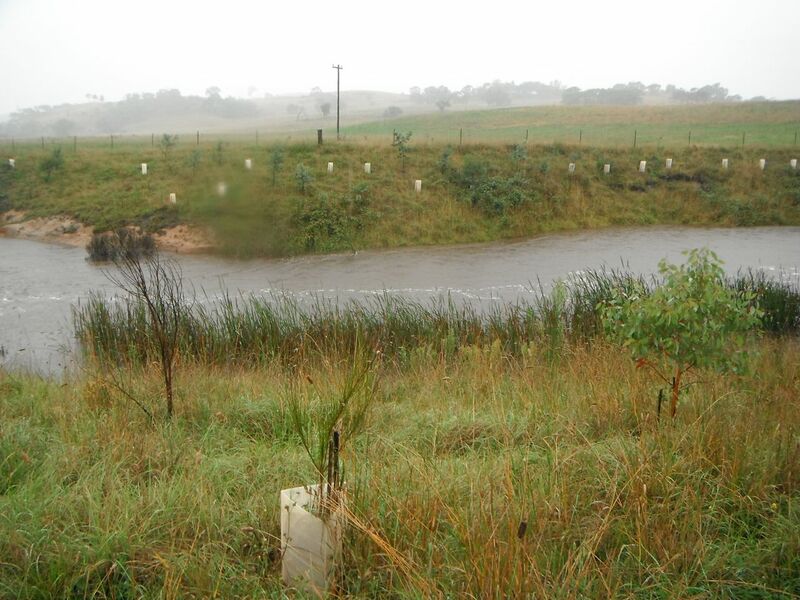 Instream wetland forming as a result of Peter Andrews’ Natural Sequence Farming demonstration at Mulloon Creek Natural Farms. This site was down to bedrock before the works began. A new bar begins to form, holding moisture for longer and allowing stabilising vegetation to establish. 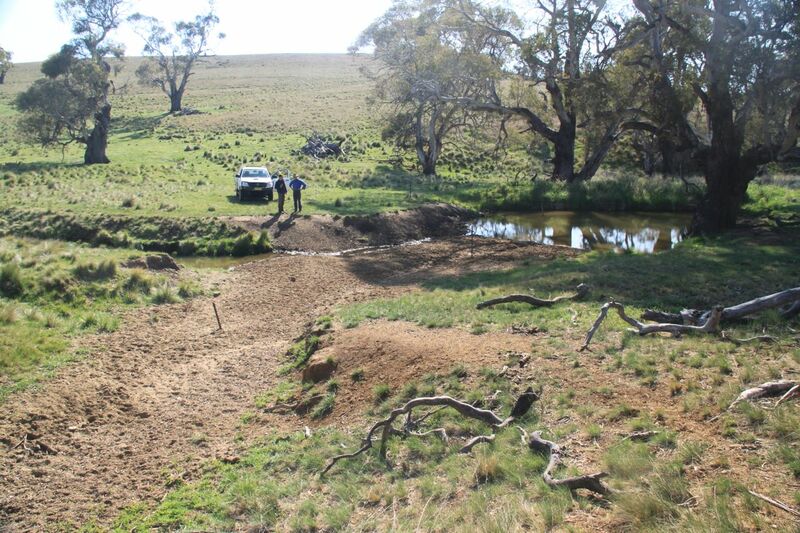 This bar which has formed as a result of Dimity Davy’s structure downstream has begun to stabilise with vegetation. With the exclusion of stock, Cumbungi (Typha) and Phragmites reeds are beginning to establish. 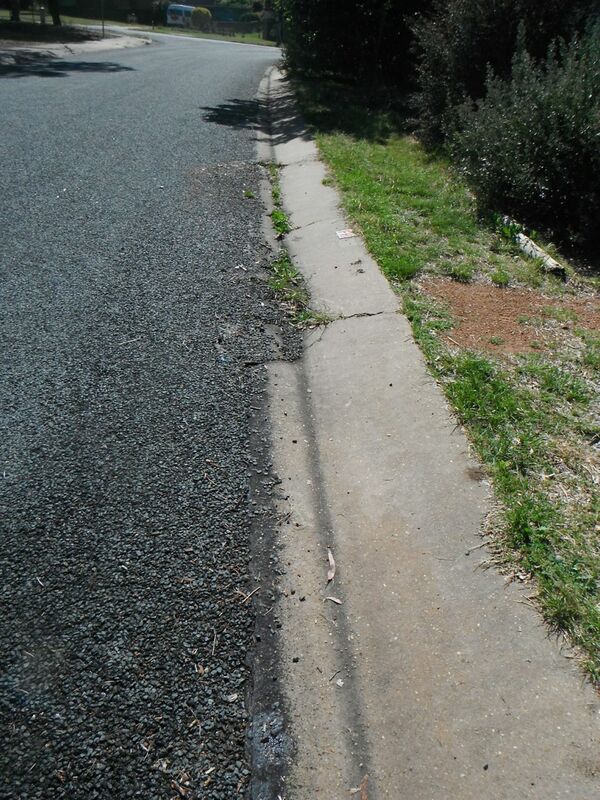 Universal process: Add a ‘structure’ to a gutter (a bit of spilt asphalt) and a few weeds growing from cracks and it even happens there. That pretty much sums up our work, so if you’re interested in helping to set nature’s repair processes into action, please contact us to discuss our design, consultancy and implementation options. Please visit and ‘Like’ our Facebook page to hear about future posts. Hazell, D., Osborne, W. and Lindemayer, D. 2003. 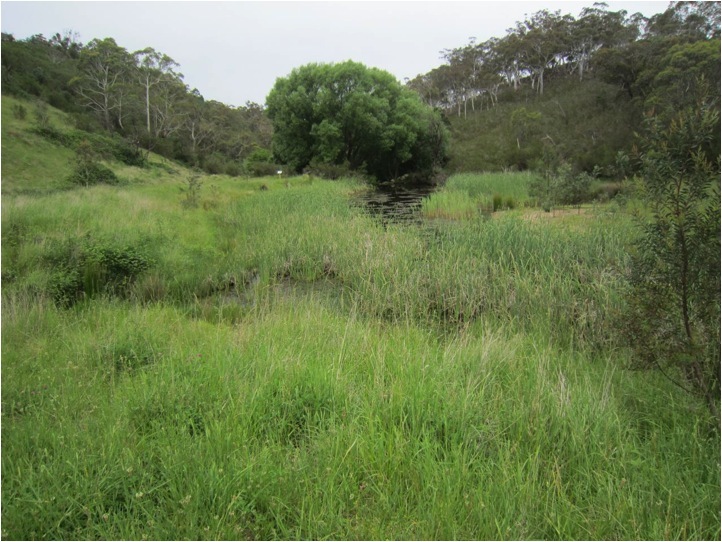 Impact of post-European stream change on frog habitat: southeastern Australia. Biodiversity and Conservation, 12: 301–320, 2003. Zierholz, C., Prosser, I., Fogarty, P. and Rustomji, P. 2001. 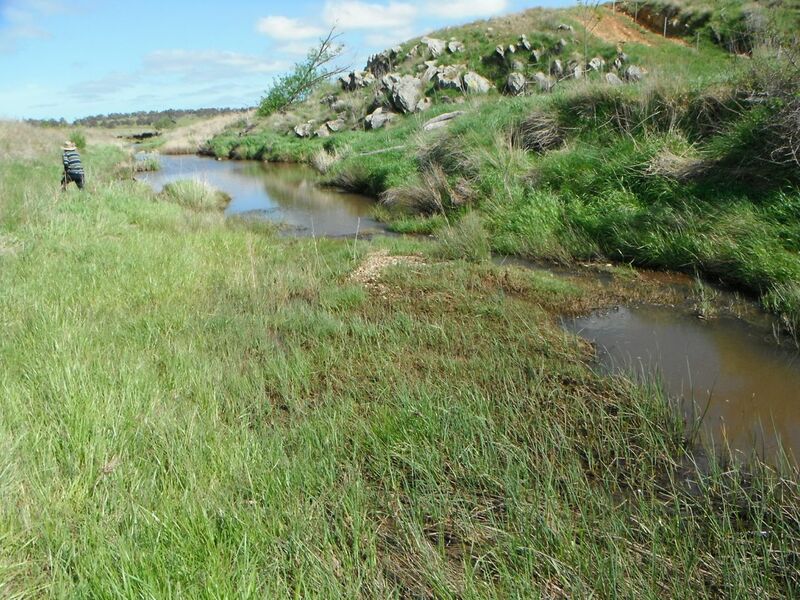 In-stream wetlands and their significance for channel filling and the catchment sediment budget, Jugiong Creek, New South Wales. Geomorphology, 38: 221-235. When building natural capital (including beef or wool), increased potosynthesis is the goal of any land manager. Available moisture is, of course, a key factor. 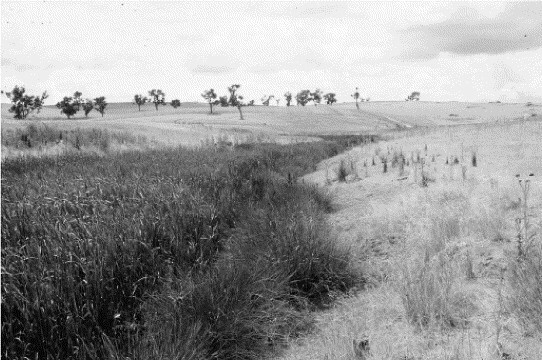 At the time Europeans settled in South-Eastern Australia, many broad upland valleys were described as chains of ponds or swampy meadows. There are a few of these well hydrated, very productive systems, effectively drought proof systems still remaining (for example the Hazell’s property), but the majority have been severely eroded and subsequently drained (click on the following for an outline of the degradation process, in diagrams or the scientific literature). 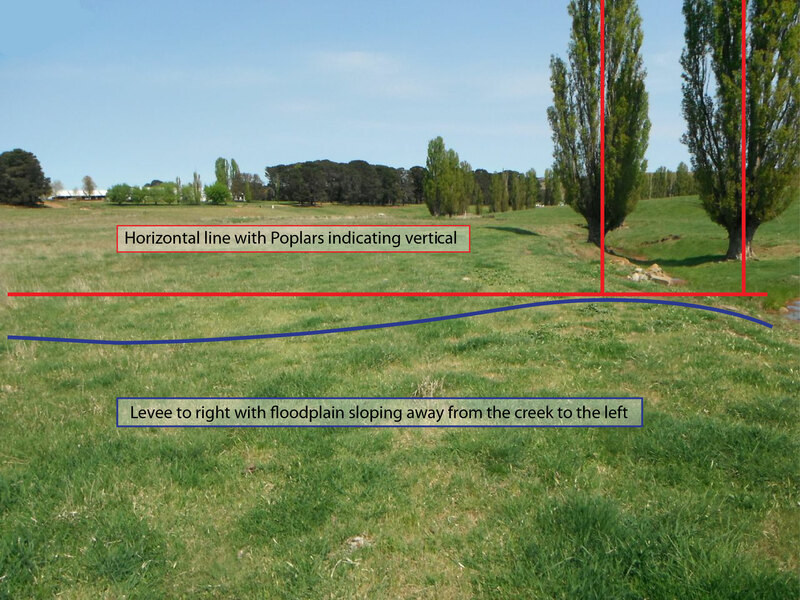 At Tarwyn Park, Peter Andrews demonstrated the potential primary production benefits from reinstating the original floodplain processes and rehydrating the surrounding landscape. 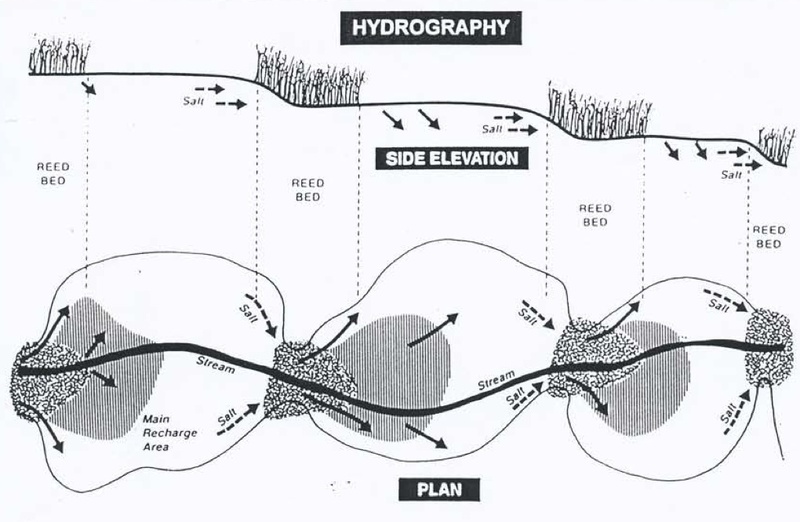 One way of doing so is by raising the alluvial water table through lateral infiltration (as described in the post Floodplain water storage). The speed this occurs depends on the soil type, but if it’s going to happen any time soon the main driving factor is a fairly constant supply of water from the catchment above. High in the landscape, inflow from the catchment above is generally only available for a short period of time. Where this is the case, the effectiveness of relying solely on a lateral hydration approach is limited, as a severely drained landscape will take a considerable time (maybe several lifetimes) before the water table is raised high enough to enhance plant growth on the floodplain. Where short sharp bursts of runoff are available, the fastest return can be achieved by reinstating the old flood flows. Water spreads out across the landscape once more, soaking into the floodplain for the extended use by the plants and soil life. Sediments are also deposited, the process which has made floodplains the rich production zones they are worldwide. Basically, it’s recommissioning nature’s flood fertigation system. When siting structures, an understanding of these processes is the key to getting the most bang for your buck. 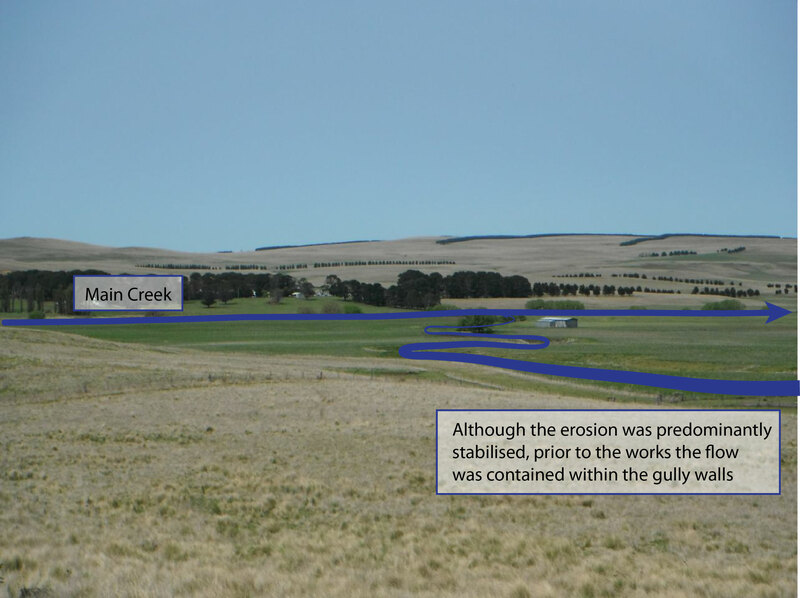 A structure in an inappropriate location may get the water up onto the floodplain, but it will soon spill back into the gully, maybe even worsening the existing erosion. 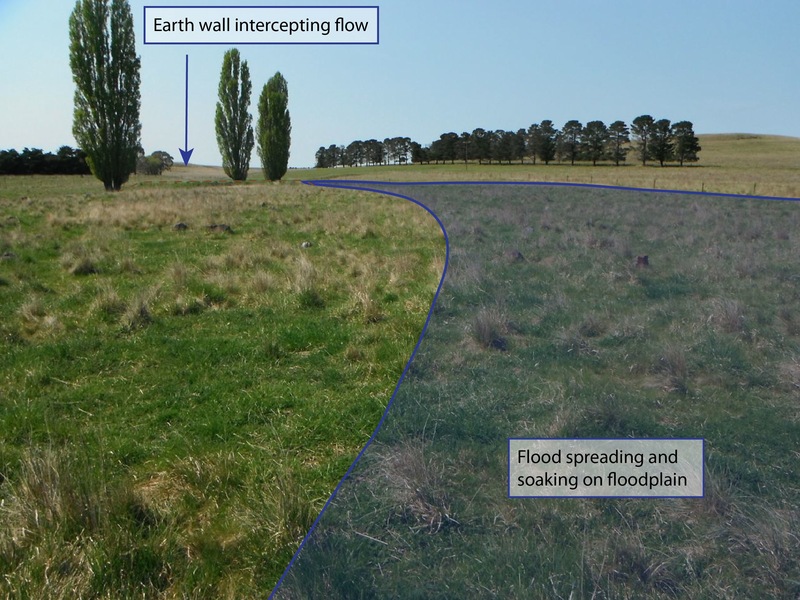 In contrast, a well positioned structure results in the flow heading away from the watercourse, spreading into a more passive flow and hydrating the floodplain surface before re-entering the stream sometimes hundreds of metres downstream. On Gunningrah, Charlie and Anne Maslin have sited their structures as well as anyone I’ve seen with this goal in mind. Having taken inspiration from Peter Andrews on ‘Australian Story’ and attending a Natural Sequence Farming field day, Charlie has since constructed around 40 leaky weirs on Gunningrah (For more information about the Maslin’s farming prowess, see their profile in the Soils for life case studies). There are a range of positive results which the Maslins have achieved depending on the landscape position of the works, but the following couple of examples are a good demonstration of utilising the original flooding processes mentioned above. 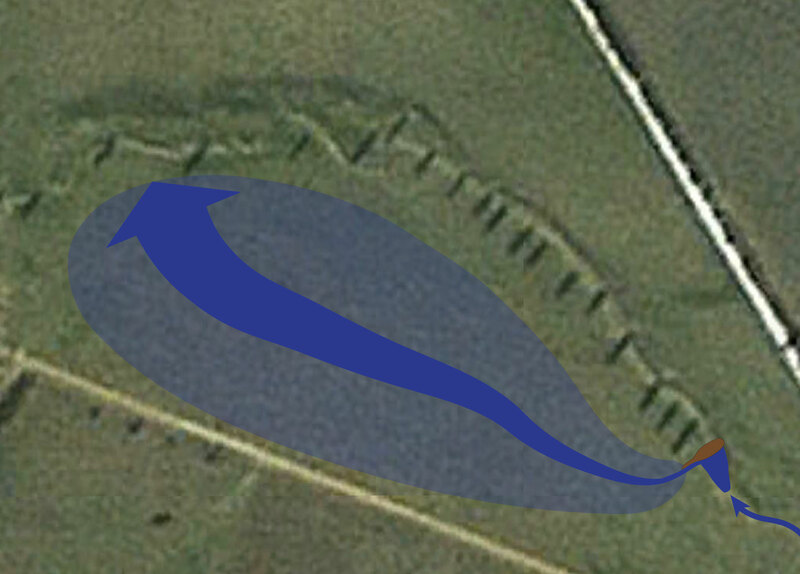 An earth wall structure intercepts the flow in the channel, reconnecting it with the floodplain. 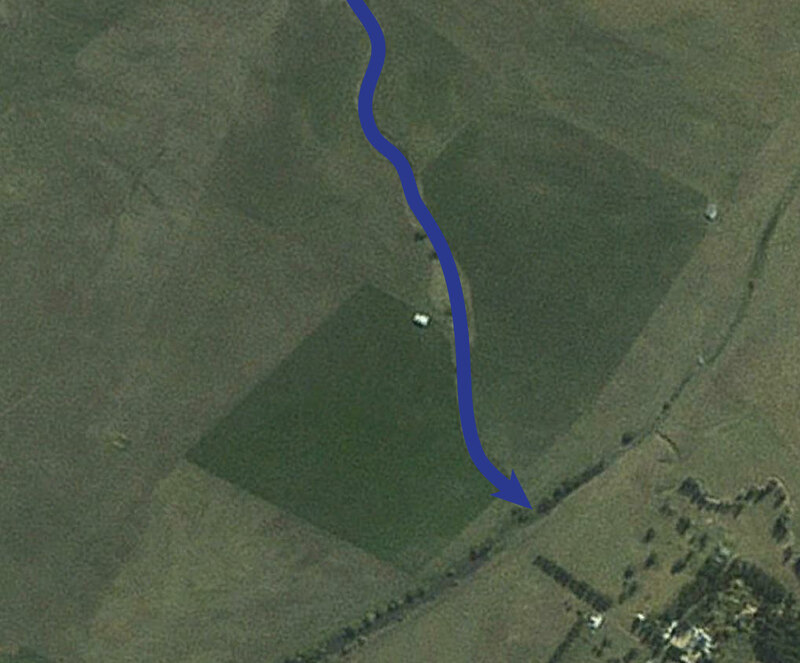 The flow re-enters more than 500m downstream, with the potential to irrigate about 6 ha of pasture. Looking upstream at the same structure, the flow spreads significantly across the paddock. Debris in the middle of the paddock, around 50m from the main channel. Flow path before the works…. 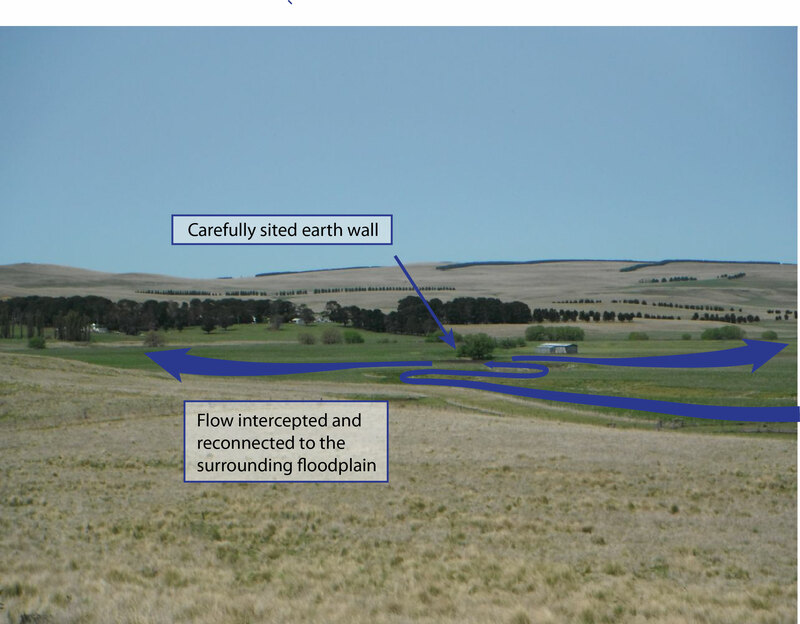 An earth wall intercepts the channelised flow, spilling onto the surrounding floodplain. For an idea of the extra water harvesting potential which results, 0.25 Megalitre is stored for every 25mm of water that’s accepted by the landscape per hectare. 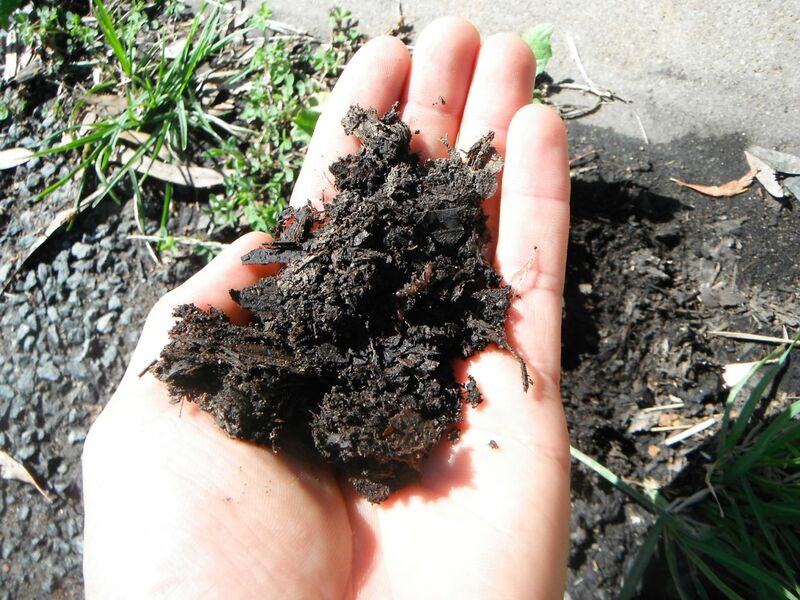 A healthy topsoil can receive far more than that. In case you’re still wondering “How can water flow away from the main watercourse? Isn’t that always the lowest point?” It is in a young landscape, but Australia’s pretty geriatric as far as watersheds go. In Back from the brink, Peter Andrews talks about water flowing on the high ground (of the floodplain). This phenomena was observed by plenty of early explorers and it’s also well accepted in the scientific literature. In short, when a watercourse spills its banks, the water slows down, depositing the heaviest sediment. In time, a natural levee is built as seen below. If you’re interested in getting these processes happening once again on your land, contact us to find out about our design, consultancy and implementation services. This is a pictorial tour of the degradation and dehydration process that the Australian landscape went through post European settlement, along with one of the major aims of Peter Andrews’ Natural Sequence Farming approach, namely the rehydration of the Australian landscape. If you were one of the early explorers, walking into a wide floodplain system in the early 1800s, more than likely you would have found some form of discontinuous watercourse. One example is known as a ‘chain of ponds’, in which you’d find small bodies of open water, about a metre below the level of the floodplain, held in place and separated from the next pond by a marshy plug of reeds such as Phragmites. These ponds weren’t the whole story though. They were just the tip of the iceberg and indicated the level of the water table under the rest of the floodplain-step. That is, moisture within a metre or so of the toes of all of the plants on the floodplain. When a decent flow occurred, rather than it rushing downstream, the reed beds would slow the water causing it to gently rise and flow over the banks onto the floodplain. This gave the water plenty of chance to infiltrate and recharge the aquifer below (a wise move for a landscape to make when the next generous rain might be a few months away). You might also notice something strange; the banks of the creek are higher than the rest of the floodplain. This is because when the water spills over the banks, the largest sediment settles out first, building up a levee over time. With the landscape scouted, settlers soon arrived with their animals, ring barking as they went. There weren’t many stock troughs in those days, so of course the animals had to drink from the creeks. The hard hooves soon cut tracks into the reeds and were one of the ways the marshy plugs were killed off. With the plugs gone, coupled with the cleared, burnt and overgrazed hillside up above the floodplain, water could now build some momentum, and soon scoured out the deep erosion gullies we still see today. With the ponds no longer in place, the gully turned into a really efficient drain…. … lowering the alluvial aquifer…. … down to the base of the incised channel. Once this occurred, rather than plants having moisture 1m below, they’re high and dry and at the mercy of the infrequent rainfall patterns experienced in much of the Australian landscape. Once a channel is deeply incised, in many places even a large rainfall event is confined to the channel. This deprives the floodplain of the soaking sheets of water and fertile sediment of yesteryear. Peter’s approach is about replicating the job that wetlands used to do. He creates ‘leaky weirs’ using locally available materials. Vegetation is an important component of the leaky weirs, with the fibrous root system of bioengineering plants such as willow used to tie the boulders together. This approach results in structures that are a fraction of the cost of the highly engineered structures commonly built by authorities. Peter also believes that the exclusion of livestock is important, except for periodic crash grazing. The weirs enable chains of ponds to re-form, which begin to raise the alluvial aquifer (particularly through buried old creek lines which act as gravelly intake areas along the banks). The rehydration will obviously happen faster in sandy soils than it will in heavy clay, but slowly the aim is for the alluvial aquifer to be raised. This is water harvesting in the form of reinstating a natural landscape process. Eventually, the goal is to reinstate a drought-proof landscape.